Apart from the fact that he emerged from 27 years in apartheid prisons bearing so little malice. And that he insisted on “reconciliation” being central to a truth commission in order to heal wounds caused by years of bitter racial hatred. And that he donned a Springbok jersey and took to the field during the 1995 rugby World Cup final in a bold bid to unite the nation behind the mainly-white South African team. And that he stepped down after just one term as president, unlike too many world leaders who, once given a whiff of power, cling to it until it destroys them or they destroy the nation they are leading. These are some of the anti-apartheid icon’s better known qualities. But for journalists lucky enough to track his remarkable career from the day he walked out of prison in 1990, through the years of transition to the first all-race elections and the presidency in 1994, and on until the day in 1999 that he bowed out — far too quickly for many — of the political arena, there was more, much more. This was no ordinary politician. Covering the “Mandela story” was a life-enhancing experience. He humbled us all into trying to be better human beings and, more especially, to embrace reconciliation at a time when all South Africans, black and white, were still bearing the scars of apartheid. Take the time when — during a very tense political campaign rally in Alexandra township on the edge of Johannesburg, when anti-white sentiment was whipping through the crowd after yet another massacre of black people reportedly by a white “third force” — Mandela stopped mid-speech and fixed his attention on a white woman standing somewhere towards the back. He called her on stage and embraced her warmly, recounting how in 1988 while in Cape Town’s Pollsmoor prison he had contracted tuberculosis and was admitted to hospital where he had been under her professional nursing care. The mood in the crowd changed. Large roars of approval drowned out the snarled demands for revenge. And there was the time when, as South African president, Mandela was hosting a meeting of the Southern African Development Community, a regional economic grouping. All the key presidents and prime ministers from across the region were there. They had to come up with a united response to yet another crisis somewhere in Africa. Journalists had been waiting since morning for the press conference. An agitated radio reporter had to dash off mid-afternoon to pick up her son from school, praying that the press conference would not take place while she was away. She got back just in time and the boy was sitting at her side when the leaders walked in, Mandela in his trademark “Madiba shirt”, the others in formal suits. The boy beamed, so did his mother. The journalists were spellbound while the African leaders looked on in bemusement. This became the pattern. We watched in awe as Mandela time and again stepped easily into the role of senior world statesman, and we watched humbled when his own fragile humanity was exposed. During divorce proceedings he confided publicly that the woman he loved so deeply, Winnie, had not spent a single night with him since his release from prison. One of the many defining moments of his relentless efforts to reconcile deeply divided communities came when he visited Betsie Verwoerd, widow of the architect of apartheid, Hendrik Verwoerd, who had effectively put Mandela in jail. It was under Verwoerd’s term as prime minister from 1958 until he was assassinated in 1966 that the African National Congress and the South African Communist Party had been outlawed, driving Mandela underground and leading to his eventual arrest, prosecution and jailing for life in 1964 for “acts of sabotage” and “conspiracy to overthrow the government”. The “tea with Betsie” meeting took place at her home in a whites-only enclave known as Orania in Northern Cape in August 1995. Mrs. Verwoerd, then 94 and very frail, afterwards said little apart from the fact she was happy the president had visited her. Her granddaughter, Elizabeth, was less welcoming, reportedly stating that she wished rather that he had been “president of a neighbouring country”. 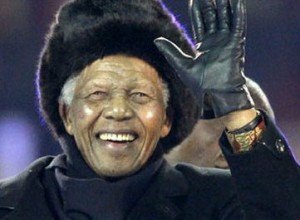 Mandela was gracious and generous, saying the way he had been received in Orania “was as if I was in Soweto,” the sprawling black township outside Johannesburg where he is regarded as a hero. Always ready to stress that he saw himself as just one in a long succession of South African leaders, he posed beside a six-feet tall statue of Verwoerd erected at Orania. “You made him (Verwoerd) very small,” he said in disappointment to the residents of Orania, as, at six feet two inches (1.90 metres), he towered above the sculpture. Yes it was. Mandela made a brief speech stressing the dawning of “a new South Africa where all South Africans are equal”. Then he dropped his ballot into the box and, literally glowing in the early morning sunlight, smiled long and happily. It was the kind of smile that you know is not put on for the cameras. The kind that wells up from the very depths of the soul. In Mandela’s case, a very rare soul indeed. Bryan Pearson, AFP’s Middle East English desk chief, worked as an AFP correspondent based in Johannesburg covering the period from Nelson Mandela’s release in 1990 until the end of his term as South Africa’s first black president in 1999.